I run a “Mastermind group” of successful online entrepreneurs. In addition to having an email list where we have discussions on various topics pretty much every day, we also meet in person twice a year. The group is specifically set up to have a wide variety of businesses. Some members identify themselves as email publishers, sure, but others have wide-ranging businesses which are enabled by the Internet, and they may or may not use email as an integral part of their businesses. He was standing on his chair for emphasis, and he was absolutely serious. There was too much spam polluting the email environment, “no one” looks at email anymore, and new technology was making email obsolete. He warned us we had to look to the future — mainly that new technology — to stay competitive in the every-changing online business world. That event and urgent pronouncement was in …April 2003. Since then, I’ve heard it again and again from various other people. Yet more than a decade later, that first friend is indeed still using email publishing as an integral part of his business. And so are many, many others (how do you get your Amazon order receipts?!) Meanwhile, the tech he touted in 2003 — RSS* — is still barely used, and then mainly by highly tech-savvy people. There are indeed some challenges with email. Too much spam is polluting the email environment, though today, while spam is a much higher percentage of email than it was then, tech has raced ahead on the filtering front, too, and we actually see less spam now. Much less: 10 years ago I got about 300 spams/day. Now I usually get none into my inbox and when I do, it’s one or two. What a huge difference! Why does email survive? No other technology has proved as useful for both one-on-one and many-to-one communication. 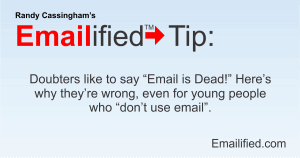 So don’t let the naysayers give you pause: even well-known industry pundits have been saying that “email is dead” for years and years, but it’s still used by hundreds of millions of people because it’s useful, it’s easy, it’s extremely cheap, and it’s ubiquitous. There is definitely still room for improvement, and while progress is slow, there are improvements still being made. So keep pressing forward to get the advantages that true, subscription-based email brings to your business. I think RSS is fairly easy to use, from both the user’s, and distributor’s, perspective. I spent a few minutes learning the XML syntax and successfully had a few successful test posts on my personal website. I admit I’m not savvy in computer programming and I wanted to keep things simple, but my experience with RSS was fairly painless. Has it changed much in the last 13 years? That you “spent a few minutes learning the XML syntax” pretty much proves my point: most of the people online don’t even know what XML (or, again, RSS) is, let alone how to learn XML syntax to implement it. I’m not all that tech savvy, but I landed here by clicking the link in the post that landed in my RSS/News Reader. It’s by far my preferred way to receive and read blog posts and regular updates from the businesses I subscribe to. Things in my email box tend to pile up a lot more than things in my reader. I think emails seem more like work/chores (filing receipts, replying as necessary) whereas the things in my RSS reader are the carefully curated things I *want* to read. It’s like I’ve made my own little daily newspaper with just the things I want to see. A few years ago when Google Reader was being discontinued it was big news on a lot of the ‘mommy blogs’ as they compared which replacement reader might be the best. I really don’t think of RSS feeds as overly technical (at least from the reader’s perspective). And again, I think you’re a lot more tech-savvy than most. I wonder if it’s the introduction of readers as apps on tablets that makes it seem less tech-deep? Those mommy blogs I mentioned are definitely not followed by very tech-savvy people, but they were able to figure it out when it was presented as an app. Hm, good thought. You’re probably right! Too, they were shown how to do it, and they had a goal in mind. I do still wonder how many have realized they can use it for other sites (as you clearly did!) and were able to add other feeds. I think the biggest hurdle is just jumping in intitially. I use Inoreader (which was the closest I could find to a Google Reader replacement at the time), but most of the people commenting on those blogs were leaning towards the shiny ones like Feedly. There were definitely very detailed (but simplified) walkthroughs to get those people up and running on the apps, but once they got a couple of subscriptions in, the apps themselves tend to suggest others, not unlike podcast apps. An aside on spam: a few years back the service provider offered a low-priced spam filter… and as soon as it was activated my inbox was flooded with 300-500 spams a day! I told the server to de-activate it, and why. Within one month spam was down to average – about one a month.